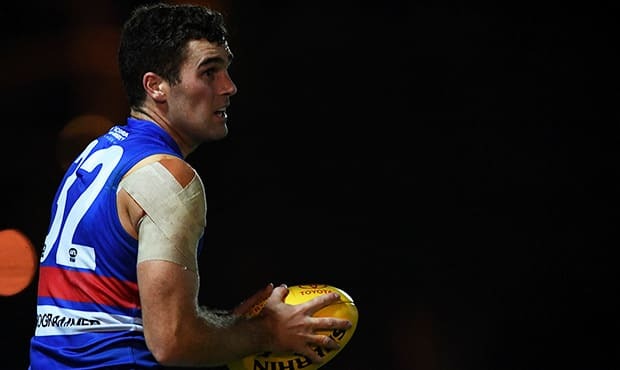 The Western Bulldogs’ big man stocks have been bolstered this week with Kieran Collins and Lewis Young both committing to the Club beyond their current deals. Collins (2018) and Young (2019) are the latest in a line of Bulldogs to have extended their contracts, with Patrick Lipinski, Clay Smith, Marcus Adams, Tim English and defender Bailey Williams also recently signing extensions. The strongly-built Collins was taken with the 26th pick in the 2015 NAB AFL Draft, and went on to play is first AFL game against Greater Western Sydney in Round Nine, last season. 20 years old in December, the Dandenong Stingrays product has averaged 12 disposals, five marks and two tackles per game in seven games for Footscray this season. The South Australian born Young was the Bulldogs’ third pick in 2016 NAB AFL Draft (49th overall), and the youngest player selected at just 17. Bulldogs List Manager Jason McCartney said the Club was pleased to retain both players. “Both Kieran and Lewis have shown some really encouraging signs in their time at the Club, McCartney said. Lewis Young scraped into draft eligibility by just 11 days, but McCartney said the former basketballer has already shown strong character and has significant potential. “The way that Lewis has adapted to the AFL system after coming across from Adelaide at such a young age has been fantastic, he said. “On the field, he’s got exceptional speed and agility for someone his size and a reliable pair of hands.